Gaglione Brothers in Grantville (10450 Friars Road, Suite B), though, has managed to take the cheesesteak out of Philly without taking the Philly out of the cheesesteak. At the most basic level, a cheesesteak is chopped steak cooked on a griddle and served with cheese in a long, soft Italian bun. From there it gets more complicated. What type of cheese? Provolone, American or Cheez Whiz? With or without onions? What about peppers? Most agree that the hallmark of a good cheesesteak is the balance of flavors and textures and the “drip factor.” Gaglione’s gets this balancing act right. The bun absorbs the meat and cheese juices without soaking through. 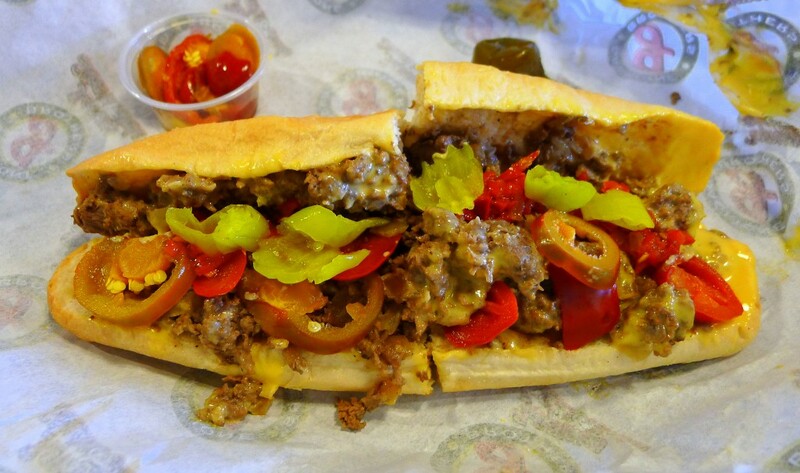 Perhaps the most commonly debated cheesesteak issue is the choice of cheese. Abhorrent as the stuff may be, the perfect cheese for a cheesesteak is, believe it or not, Cheez Whiz. Yes. The Dayglo-orange, heavily processed stuff may be an affront to cows, not to mention all things holy, but the flavor of this chemical-laden, non-dairy, highly fatty product marries perfectly with the meat. God may never have intended Cheez Whiz to exist, but if He’d ever tried a cheesesteak, His most certainly would have been with Whiz. And, for me, at Gaglione’s, it’s the Whiz. As with any good Philly cheesesteak, the beef is the star (though, somewhat sacrilegiously, Gaglione’s offers chicken versions). The Whiz rounded out the sandwich’s flavor, the bread soaked up the juices and a trip to Gaglione’s superb condiment bar yielded hot cherry peppers, pepperoncinis and an outstanding hot-pepper relish, all of which danced on the beef, providing accents. The American-cheese version was, quite simply, a poor substitute for the Cheez Whiz. It lacked the assertiveness of the gooey stuff and the character of the provolone, a better choice. While Pat Olivieri is generally recognized as the cheesesteak’s inventor, Joe Vento of Geno’s (across the street from Pat’s) claims to have been the first to put provolone cheese on cheesesteak—he always swore by it. The relatively mild, slightly salty flavor and semi-hard consistency makes it a natural for the sandwich. It’s no Cheez Whiz, mind you, but it is a natural. The perfect pairing with the cheesesteak are Gaglione’s garlic fries. Fresh, crisp, seasoned with parsley and with the garlic’s spicy qualities on full display, there’s nothing subtle about them. Skip the Cheez Whiz fries, though. Along with a cheesesteak, they vastly exceed the FDA’s recommended daily allowance for processed food. Your cardiologist, however, may appreciate the gesture. Ask 10 Philadelphians where to go for a cheesesteak and you’ll get at least 11 answers: Pat’s, Geno’s and John’s Roast Pork are common nominees. I might not be from Philadelphia, but I have my own nominee, and it isn’t from Philadelphia either: Gaglione Brothers.